Royal Enfield is a highly regarded name in India and in many foreign markets around the world. The bikes from the brand are also one of the most customized bikes on the face of this planet. 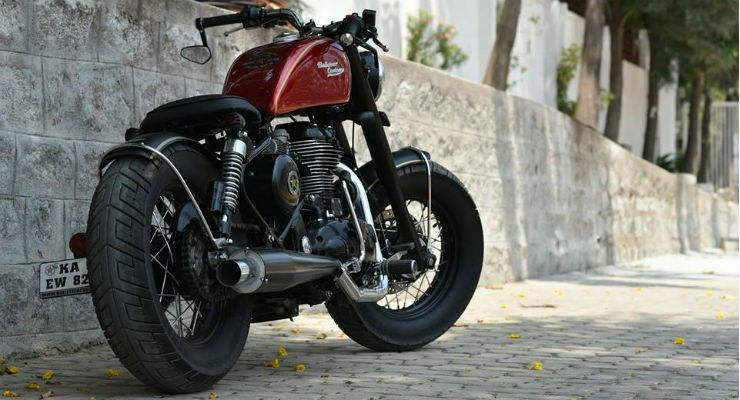 We bring you ten beautifully modified Royal Enfields from India and around the world. 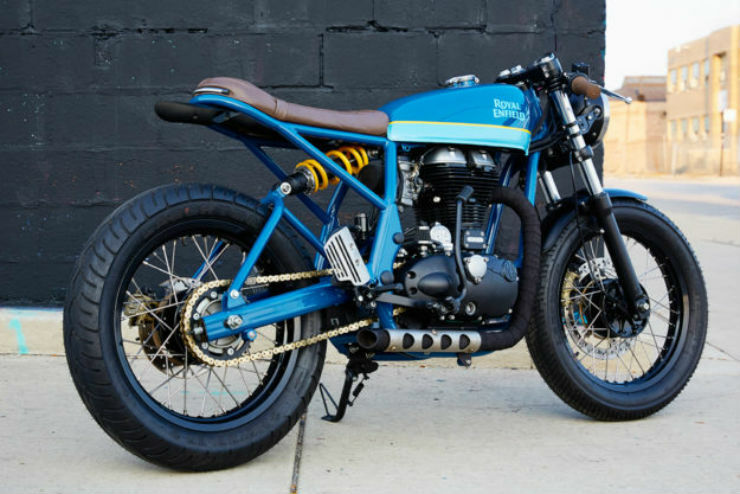 The Chicago based motorcycle customisation shop has built some beautiful option based on various bikes. 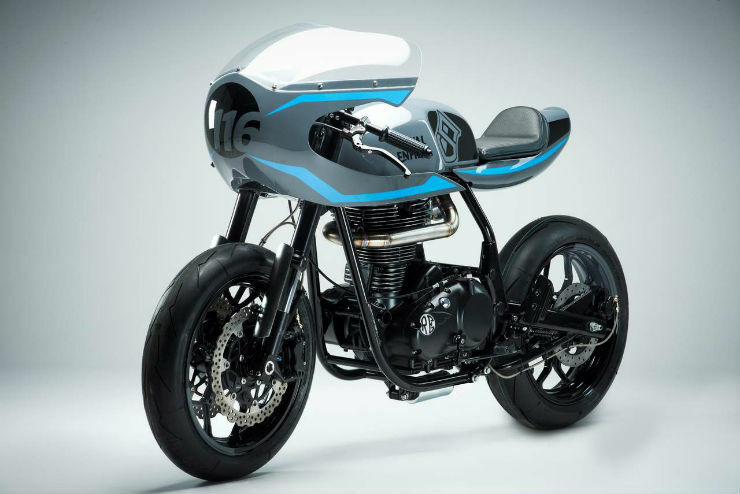 This is one based on the Royal Enfield Continental GT, which has been discontinued now. The bike gets the original frame and the swingarm, apart from that everything has been fabricated. The bike gets a new fabricated frame that holds the rear monoshock that has been painted in yellow. The sub-frame is also new and gets a new leather seat. The modern techs include an LED tail lamp integrated to the rear of the seat. The engine is now finished in satin black, with hand-brushed aluminium covers. The fuel injection system has been replaced with a performance carburettor performance kit. The bike gets lowered clip-on, a new single speedo and tachometer from KOSO, vintage styled headlamp and LED turn signals. The whole bike has been given an exemplary blue colour. 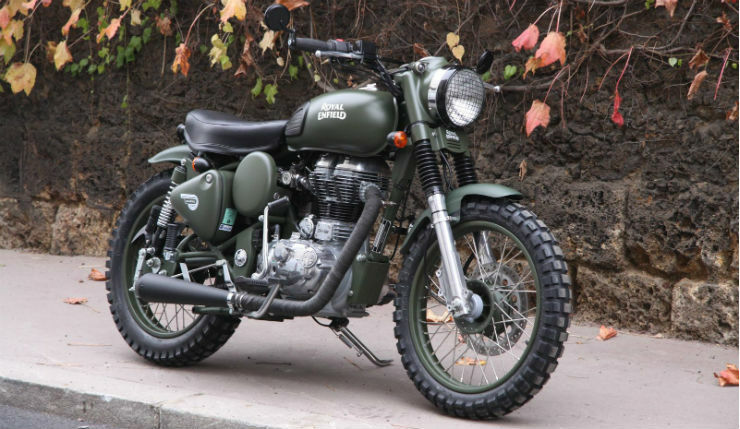 Here is a Royal Enfield Classic 500 in military green colour that has been customised to be a scrambler. The bike gets a new handlebar that has cafe-racer styled end-mirrors. The bike also gets a new exhaust system painted in black. The modders have updated the regular road tyres to big block rubbers that add a masculine look to the vehicle. The bike also gets updated front suspension and a grilled headlamp cover. 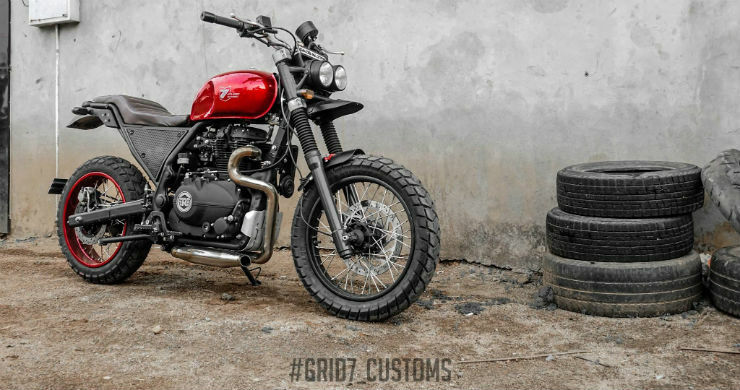 This is a Royal Enfield Himalayan based customisation that has been modified in India by a popular house, Grid7 Customs. This sporty theme based Himalayan modification looks really good. The chassis of the bike gets minor modifications to fit the custom fuel tank. The side panels of the bike have been updated too. The seats are finished in dark brown leather. The bike also gets repositioned indicator lamps, custom tail lamp, twin headlamps and a new meter console. The gets customised front-rear mudguard and a custom exhaust system that increases the power delivery of the 411cc engine. The bike was showcased at the 2017 Wheels and Waves Festival held in France. The bike was commissioned by Royal Enfield and was made by Sinroja Motorcycles. The Himalayan has lost its characteristics completely from bold and brawn to become a good-looking gentleman’s ride. The bike gets a new handlebar, new seat, a new exhaust. The bike also gets 16-inch rims with spokes, fatter profile tyres with white painted walls and a grey paint scheme. The suspension system of the bike has been upgraded too. The bike gets front petal disc and radially mounted calliper. 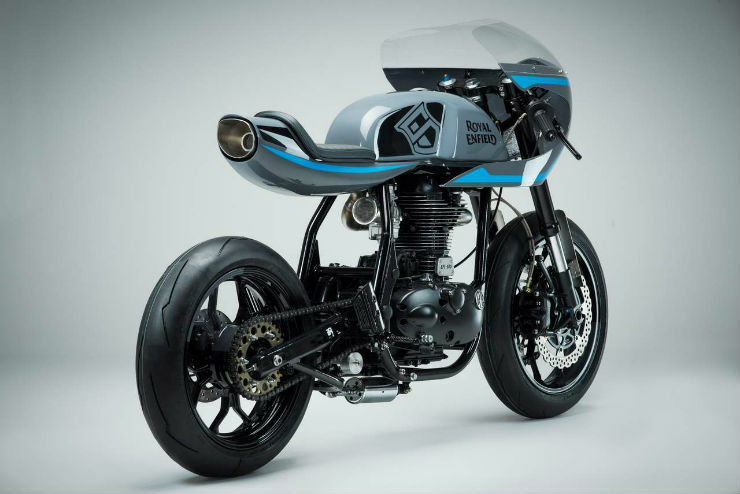 This is one of the latest Royal Enfield based custom models and was showcased at a festival in France. 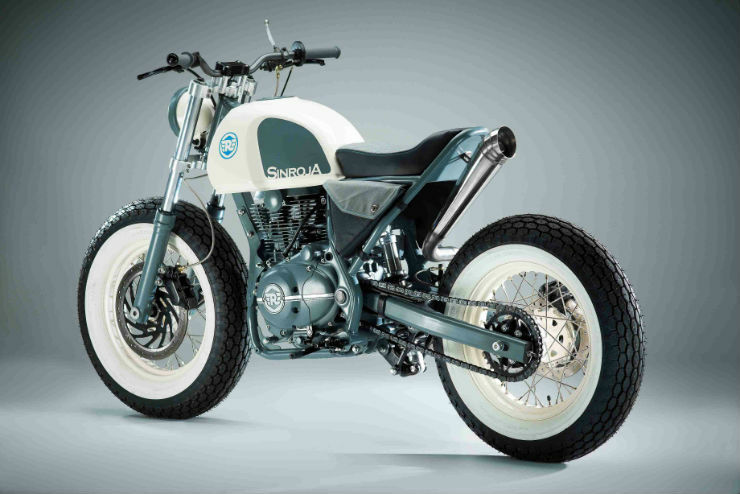 The Surf Racer is based on the Continental GT. 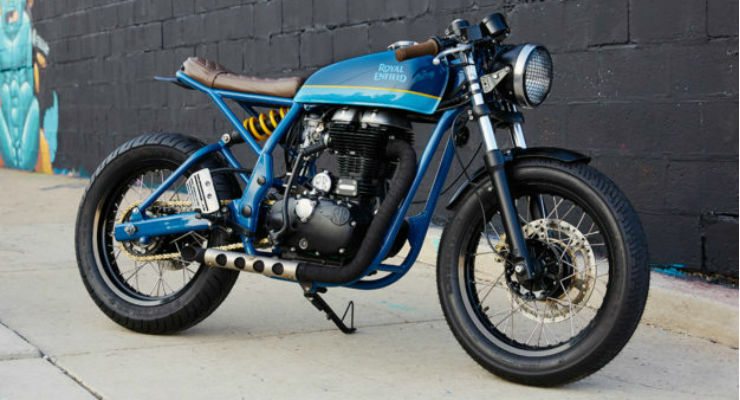 Sinroja Motorcycles worked on the model to give a complete overhaul. The UK based custom company has added a semi-fairing to the motorcycle. The faired cafe racer also has a redesigned tail with integrated exhaust. The design makes it look extremely neat. The motorcycle gets 17-inch performance wheels, upgraded tyres, upside down forks and horizontally mounted rear shock. Sinroja has also tweaked the engine. It now has more power with higher lift cams, a new engine manifold and machined piston barrels that work together to provide higher compression. A new exhaust system from Dellorto pushes the gases out from under the seat. 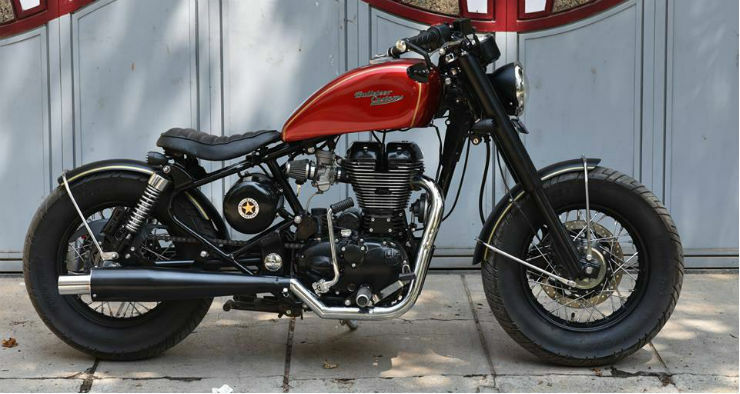 This is one of the four bikes that Royal Enfield showcased during the announcement of official customised bikes program. The bike has been altered by Bull City Customs and reeks of chrome and class. The bike gets a custom chassis with an elongated swingarm. It gets aftermarket air-filter, custom seats, new wheels, new exhaust system, new handlebars and a handmade fuel tank. 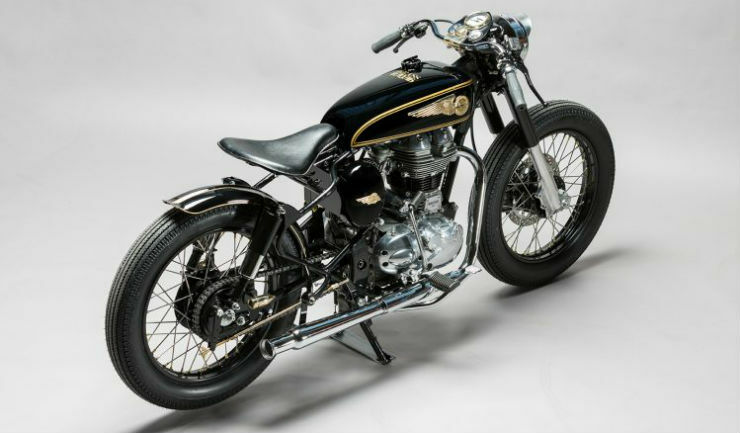 This custom Royal Enfield 500 EFI was another bike commissioned by the Royal Enfield for their announcement of official customisation program. This bike was made in 45 days flat by Inline3 customs based in Delhi. The bike gets a new bobber inspired look to it. There is also a new custom exhaust, new seat and new white wall tyres. The headlamp has been given a new grille case to save it from any hits. 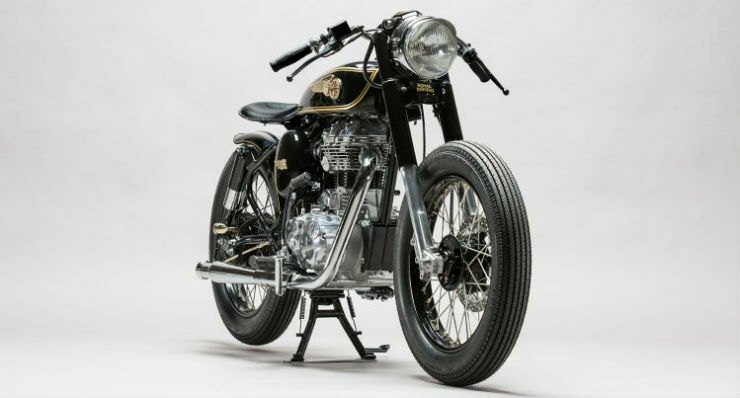 Brass Rajah or Brass king is a vintage looking modification done on the Royal Enfield Classic. The tank of the bike is inspired by the 1939 Norton bike. The rear shocks are inspired by the BSA bikes from the yesteryears. The brass can be seen at the end of the spoked wheels that have been powder coated rims. The turn signals are torpedo shaped. The Austrailian-based custom job looks as excellent and captivating as it can get. 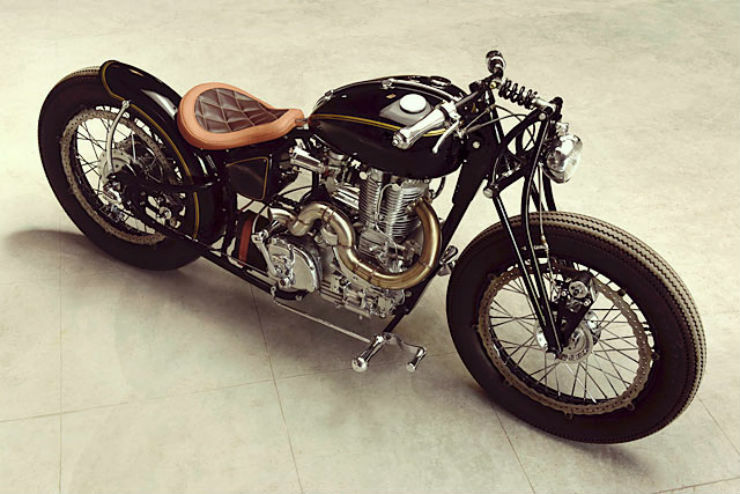 The Icarus is a custom Bobber that started life as a Thunderbird 350. The chop job makes the motorcycle look very simple and stylish. The Icarus gets 140mm tyre at front and rear with unique spoke wheels. The tank gets a red paint job while there is only a single seat. The front suspension has been upgraded to an upside down shocker while the rear suspension remains the same. Bulleteer Customs has also added subtle power mods to the engine to give it extra juice to overcome the drag from the wider tyres. The exhaust gets a black muffler. 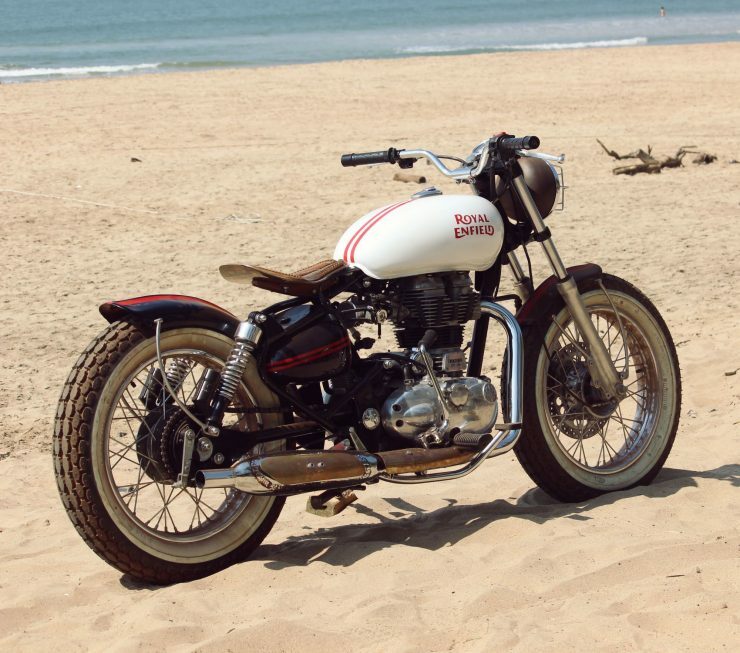 This vintage style Bobber will not fail to turn heads on the road. The old school design from J&D customs looks unique. 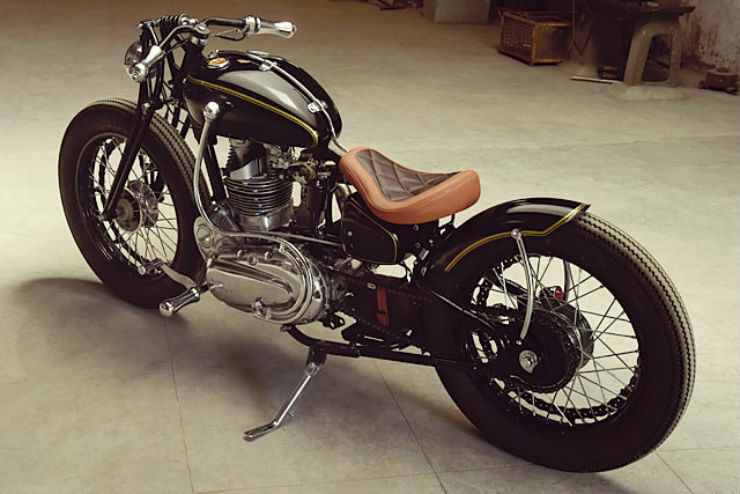 The modified Royal Enfield from India. The hardtail bobber design of the bike looks quite enticing with the original tank and the engine. The bike gets 350cc AVL engine and apart from that, everything has been handmade. Even the paint scheme of the bike is inspired by the original pinstripe of Royal Enfield. It gets modern bits like push-button start, a toggle type kill switch and a custom tail lamp switch.